This project grew from a 16C84 programmer that I built several years ago. The project is used for in circuit programming of the 16F627 or 16F628 PIC chips. These chips are very similar to the 16C84 and the 16F84 chips with several new features including a real serial USART, and a pair of comparators. The programming hardware has been used for programming 16C84, 16F84, 16F84a, and 16F627 chips without changes, The 16F627 has more configuration bits than the 16F84. This was the main difference that needed to be accounted for in the programming software. The programmer hardware is a simple parallel port in-system prototype programmer, designed by Steve Marchant, which is a modified Microchip Inc. AN589 thing. I have programmed dozens of PIC's with this simple hardware, without a single error. You will need a computer with a parallel port configured in the bios as a "standard" port. I use a Toshiba laptop that has the "bidirectional" option set. Do not use EPP,ECP or other extended modes. This computer will need to run the linux operating system if you wish to use the programming software as is (feel free to port the code to windows if you feel the need). 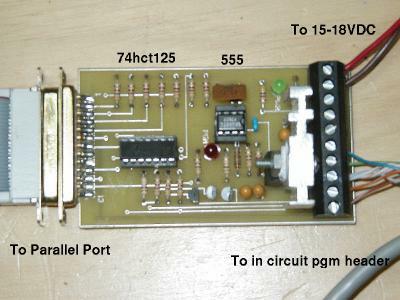 You will also need a 15 to 20 volt power supply to power the programmer and optionally the pic board.